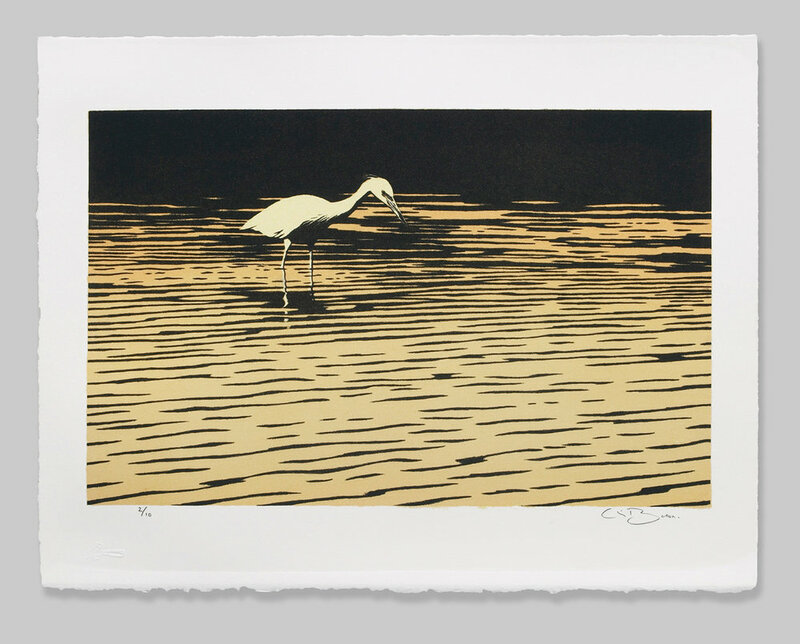 'HERON' # 4/10 •stone lithograph on BFK paper • 20.32cm x 31.75cm • 8" x 12.50"
Margaret Atwood and Graeme Gibson invite you to the second annual 'Wild Bird Ball'. A fundraising, gala event to benefit the PIBO. Featuring special guests Molly Johnson, Billy Newton-Davis and John Alcorn. Being held on April 28th 2019 at the CROW'S THEATRE in Toronto, Ontario. A message from the co-founder, Margaret Atwood .. I am pleased to donate this framed, stone lithograph that will be auctioned on the evening to help raise funds in support of the The Pelee Island Bird Observatory .. a non-profit charitable organisation devoted to the study and conservation of birds. AN OPPORTUNITY TO HELP .. and make a stand against species extinction. I have been asked and am pleased to donate a sketch/study of an endangered species that will be auctioned to help support the vital work of anti-poaching units in Garamba National Park. 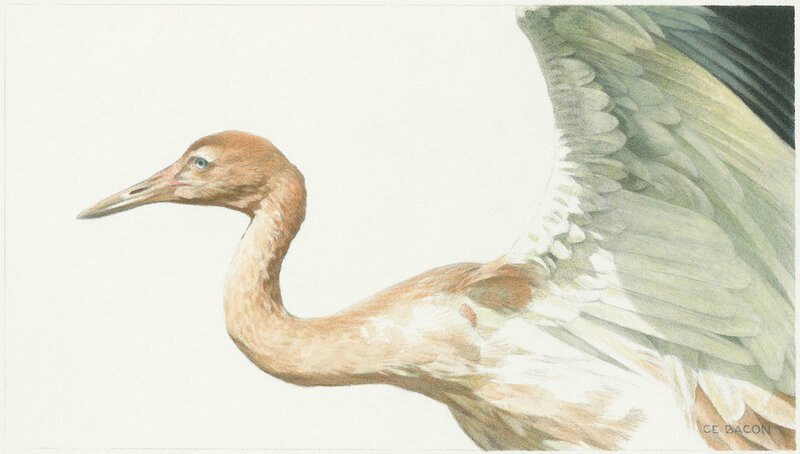 'STUDY FOR YOUNG WHOOPING CRANE' 2018 •watercolour on arches (cold press) paper •17.15cm x 29.84cm •6.75"x 11.75"
Please consider supporting the Explorers against Extinction campaign to raise awareness and significant funds that will help fight wildlife crime in Africa and beyond. A touring art exhibition and auction where acclaimed professional artists and celebrity supporters have been asked to spend 26 minutes on an artwork of any endangered species .. the same amount of time it takes for an elephant to be poached in the wild in Africa. That adds up to 55 Elephants being slaughtered everyday for their ivory. Celebrity supporters include Dame Judi Dench, Dame Helen Mirren, Sir Ranulph Fiennes, Stephen Fry, Richard E. Grant, Sophie Thompson, Mary Berry, Nick Park, Colonel John Blashford Snell and Frederick Forsyth. The exhibition will visit five UK venues including the prestigious gallery@oxo on London’s South Bank as well as touring to Manhattan, New York. All artwork will be auctioned via an online platform in aid of Explorers against Extinction nominated projects. Online registration opens September 22nd. with the auction closing Sunday the 25th. of November 2018. I am pleased to announce a collaboration with Museums & Galleries Ltd. Starting this year, you will find a selection of my work on their landmark 'Classics' range of very fine Art Cards. Distributed in over thirty countries, Museums & Galleries Ltd. is the UK's leading publisher of quality art cards and design-led stationery. They are the official publishers for the Victoria & Albert Museum, the British Library, the Natural History Museum. London, England and BBC Earth. UP-DATE: LEIGH YAWKEY WOODSON ART MUSEUM. Wausau, Wisconsin, U.S.A. I am thrilled to announce that 'Synchronicity' is one of sixty works selected from the 2017 'Birds in Art' exhibition to be included in the national tour. The painting will travel to five museums over the next sixteen months. As well, I am honoured that the Museum's acquisitions committee has voted unanimously in favour of purchasing the work for the Leigh Yawkey Woodson's permanent collection. 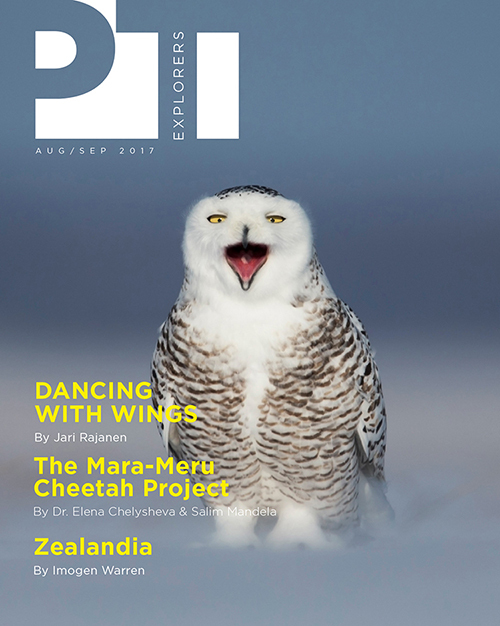 The team at PT Explorers (Dubai) have asked me to write a short, but insightful piece about my work. LEIGH YAWKEY WOODSON ART MUSEUM : 'Birds in Art' 2017. Wausau, Wisconsin, U.S.A.
'Synchronicity' will be on display in this year's 42nd annual 'Birds in Art' exhibition. Opening September 9th and running until November 26th 2017. Please visit my Homepage for a short statement about this work. If this painting surfaces, know that it was 'lifted' from a private collection in Canada a short time ago. Any information regarding its whereabouts should be directed to your local authorities. Thank you! LEIGH YAWKEY WOODSON ART MUSEUM : 'Birds in Art' 2016. Wausau, Wisconsin, U.S.A.
'LightSwept' will be on display in this year's 41st annual 'Birds in Art' exhibition. Opening September 10th and running until November 27th. *Update 24/09/2016 : The painting has now been selected for the National Tour and will travel to five Museums over the next sixteen months. HOUSTON MUSEUM OF NATURAL SCIENCE : 'Art & the Animal' 2016. Houston, Texas, U.S.A.
*Excerpt from the 'Art & the Animal' 2016 catalogue. How do I construct a solid painting, dealing with almost certainly, the most endearing creatures on the planet ? LEIGH YAWKEY WOODSON ART MUSEUM : 'Birds in Art' 2015. Wausau, Wisconsin, U.S.A.
*Excerpt from the 'Birds in Art' 2015 catalogue. Once again this year, I am donating a framed artist proof giclée print 'Study for Common Yellowthroat' as one of the prizes available to participants in the Baillie Birdathon. Important funds are raised through this event each year for bird research and conservation. "Thank you for visiting my new site. Your thoughts and enquiries are most welcome."